We’d love your help. Let us know what’s wrong with this preview of No Direction Home by Diane Winger. In this evocative fictional story inspired by today’s headlines, the immigrant family of thirteen-year-old Emma Cabezas is ripped apart. Her older brother faces deportation after attempting to renew his DACA status and her parents are dragged away in handcuffs by immigration officers. Family friend Sandi Moreno takes her in, but For a family divided, love knows no borders. 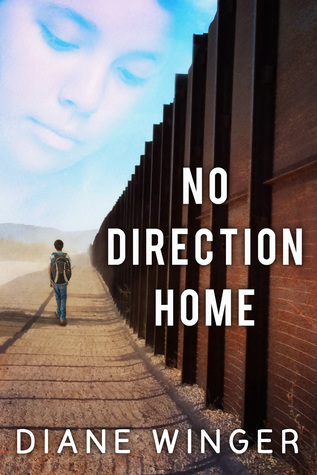 To ask other readers questions about No Direction Home, please sign up. This is a story that is very significant, especially right now. It’s told from the perspective of Emma, a 13-year-old Honduran American. It’s written in the first person, as if you’re reading her diary or having a conversation. We follow Emma and her family, trying to live in an America where some of them are not welcome. DACA and deportation play a major part, as Emma tries to navigate life without her parents and brother. Finally driven to extremes, Emma embarks on a journey way beyond her exp This is a story that is very significant, especially right now. It’s told from the perspective of Emma, a 13-year-old Honduran American. It’s written in the first person, as if you’re reading her diary or having a conversation. We follow Emma and her family, trying to live in an America where some of them are not welcome. DACA and deportation play a major part, as Emma tries to navigate life without her parents and brother. Finally driven to extremes, Emma embarks on a journey way beyond her experience. I found it difficult to read at times; because I felt Emma’s pain. Despite that, I highly recommend this book to anyone who wants to see inside the immigration question. I won this book through a Goodreads giveaway. Thanks to this book, I got 4 hours of sleep. This book was amazing. I rarely give 5 stars because I save that for what I consider truly outstanding books and this is one them. This book deals with the current immigration issues that are plaguing this nation and the DACA issue as well. I am a strong supporter of DACA so I may be biased in favor of this book as well as allowing more people in from Mexico and Central America. The reason? What she covers I won this book through a Goodreads giveaway. Thanks to this book, I got 4 hours of sleep. This book deals with the current immigration issues that are plaguing this nation and the DACA issue as well. I am a strong supporter of DACA so I may be biased in favor of this book as well as allowing more people in from Mexico and Central America. The reason? What she covers in this book. Emma's family is torn apart when her older brother goes to renew his DACA paperwork and is detained. Her father is deported. When he is in Honduras, he is savagely beat. She is placed with what is supposed to be a safe family while her mother goes to Honduras to care for him. Emma runs away from Colorado and tries to make it to Honduras. That is the short of it but this is a book that you have to read to find out the details yourself because my short review doesn't do this book justice. This story reached out, gripped my heart, and held it hostage as I turned each page to learn what would happen next. The author did a terrific job of making today's headlines relevant by allowing us to experience them through the eyes of thirteen-year-old Emma, who's family is shattered when her brother tries to renew his DACA paperwork, is detained, and ICE agents come knocking at their door. Anyone and everyone should read this book, especially with it being such a relevant topic. Stories like this are rarely ever heard, and usually, unfortunately, only one side is usually told - this is a fictionalized story from the victim's point of view. I admire Emma Cabezas for the way she takes on part time jobs to get some extra money in; though one thing that I felt hung in the air a little bit, was the conclusion of the Moreno family; I felt that Sandie owed Emma an apology; I wasn't the hugest fan of Mr. Moreno. Emma ended up making some wonderful friends on the journey she embarked on. It appeared at times that Emma struggled to wrap her head around some difficult life truths. I received a review copy. I gave it 4 stars instead of 5 because there was a couple times I was so bothered by what was happening that I considered putting it down. But I know the author, have enjoyed her other books, and said, Nope, I'll keep on. And I was so glad I did. Thanks, Diane, for addressing this heartbreaking issue. I describe myself as a “retired software geek” who loves hiking, rock climbing, kayaking, camping, and cross-country skiing when I'm not glued in front of her computer playing around with website designs, watching cat videos, and writing. I'm a passionate volunteer with the service organization, Altrusa International. I'm particularly involved with literacy projects in my community. My husband, Cha I describe myself as a “retired software geek” who loves hiking, rock climbing, kayaking, camping, and cross-country skiing when I'm not glued in front of her computer playing around with website designs, watching cat videos, and writing.